Relax & Communicate — When you decide to getaway, choose a log cabin rental with amenities that will enable you to relax, make conversation, and allow for some romance. These amenities might include a fireplace, jacuzzi for bubble baths, and outdoor hot tubs. 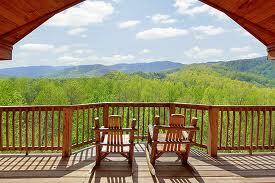 Enjoy the sight-seeing — The Smoky Mountains are extremely beautiful. You can take in the mountain peaks, waterfalls, & wild flowers throughout the National Park. Fine Dining — Try the Peddler on the River, Cherokee Grill, or The Lodge at Buckberry Creek. These restaurants are fantastic and will help create the romantic mood for the entire evening. Find adventure — Go hiking, river rafting, or zip-lining here in Pigeon Forge or Gatlinburg. The excitement will help you get your mind off anything holding back the relationship or causing stress in your life back home. Allow this escape to refresh you & your relationship. Let her go shopping — Pigeon Forge, Sevierville, & Gatlinburg have great shopping. The Arts & Crafts Community and The Village Shops in Gatlinburg, as well as outlet stores in Pigeon Forge and Sevierville have great inventory & discounts for everyone. Enjoy a Good Breakfast together — Sometimes people don’t have a chance to start the day together with a good meal, so take the time during your vacation to go to Pancake Pantry or the Old Mill for breakfast. Have a Picnic — Cabin rentals usually have an outdoor grill. Use this to your advantage & take in the outdoors for a BBQ. You’ll enjoy it! Take a walk together — whether you are on a trail or private road near your log cabin rental, on the Parkway, or hiking on a Smoky Mountain trail, you should enjoy the peacefulness together. There’s nothing better than Spring or Fall in the Smoky Mountains. Enjoy the Scenery. Go to a Show — The local Music Theaters are entertaining. The music, dancing, & comedy at some of the local Gatlinburg & Pigeon Forge theaters are amazing! Pick one or two out on your vacation & go check them out! Get a Massage — There are in-cabin massages available. You can schedule them directly or consult with your rental company to get a massage scheduled. This will help you relax and get the vacation started off right!